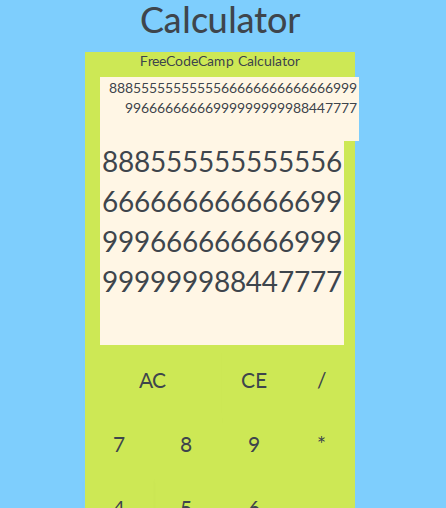 Finally I managed to finish calculator. I was stuck for a long time because of the summer break What do you think? Are there any critical mistakes? Do You have any idea for improving this app (“need to do” or “nice to do”)? The app seems to work as it should. I personally found the the text shadows made some of the text difficult to read, but did not influence the functionality of the app. Often the operation buttons are colored differently than the numeric buttons, but again, this does not really affect the functionality. I think that you got the functionality down, which i think is the underlying point of this project. If number is longer than 15 digits it gets out of screen. 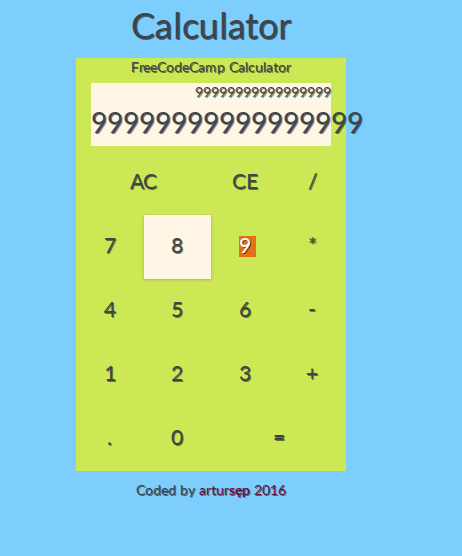 to your body in CSS so the cursor doesn’t change and the numbers on buttons won’t get highlighted. @jenovs Display size is fixed. I have to use textarea instead of div to modify size dynamically If there is no more bugs I will start coding pomodoro clock. I’ve added width 100% to textarea… hope this solves the problem? Now it’s ok. I’m on Ubuntu and I had this bug both in Chrome and FF.